As a long time hot sauce collector, I’ve always kept my eyes peeled for new ways to display my hot sauce collections. I’ve built my own, own 2 of the hot sauce cases from Perfectly Pickled (via SNS) and used regular bookcases when needed. Right before we moved to NYC, the wife and I were tooling around Portland, OR with her younger brother Jon, a soon to be famous actor. 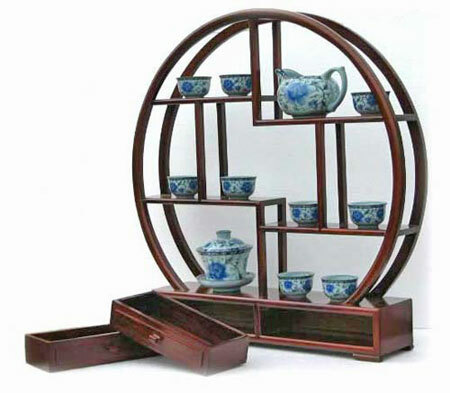 We happened upon a little Oriental gift shop were I first laid eyes these wonderful curio display racks. Once we were settled in NYC, I began a search for similar display cases but came up with zilch. Just by chance the other day, I happened across DisplayGifts.com – albeit the site is dreadful but the prices seem pretty reasonable. I’m going to order one of the cases just for my collection of Blair’s Reserves.